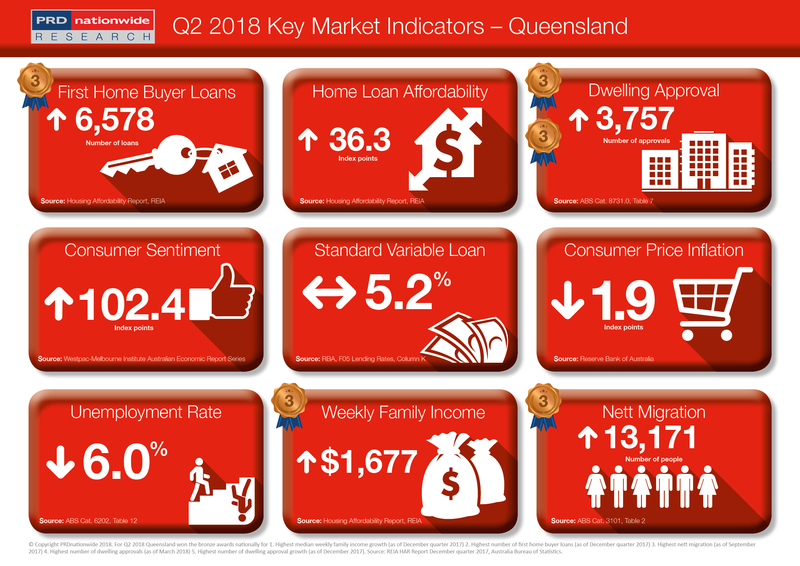 Queensland achieved 5 bronze awards nationally in the Q2 2018 PRDnationwide Key Market Data Indicator Awards. QLD has traditionally been known as the more affordable Australian state in terms of property prices, however over the past 3 quarters there has been a definite shift in affordability. QLD recorded a home loan affordability index reading of 36.3 points in the December quarter of 2017, which although is still higher than the Australian average of 31.6 index points, puts QLD in the top 3 unaffordable states. This places it right behind VIC (29.9 index points) and NSW (26.5 index points). There are 2 key reasons for this. Firstly, there is an imbalance between nett migration growth and dwelling approval growth. Nett migration was recorded at 13,171 people in September 2017, representing a 19.2% annual growth. Yet dwelling approvals only grew by 7.5% over the past 12 months to March 2018, suggesting an imbalance between property demand and supply. Factor in the increase in interstate investment interest (due to unaffordable property prices in Sydney and Melbourne), the demand and supply imbalance widens even further. Secondly, such an imbalance in demand and supply increases property prices, yet QLD’s median weekly family income only grew by 2.5%, earning the state a bronze award nationally for this category. It is no surprise that QLD also earned a bronze award nationally for the highest number of first home buyer loans (as of the December quarter of 2017), with 6,578 loans recorded. Shockingly, this placed QLD behind the number of first home buyer loans in both NSW (7,507) and VIC (9,892). Hope for improved affordability lies in QLD improving economic conditions, with the unemployment rate increasing by 3.2% over the past 12 months to March 2018, currently at 6.0%.